These Cinnamon Roll Bites are the easiest way to cinnamon roll flavor! Uses homemade or store bought biscuit dough, a great make ahead breakfast or dessert! Cinnamon, sugar and butter just make everything better, am I right? I love these little bites, especially as the days get cooler and all you want is some fresh, hot, sugary bread straight from the oven. I also love that they’re so easy, you can make them ahead and quickly finish up and bake them in the morning. That way, you can even bring them still warm and gooey to your colleagues at work. If you’re willing to share, that is. 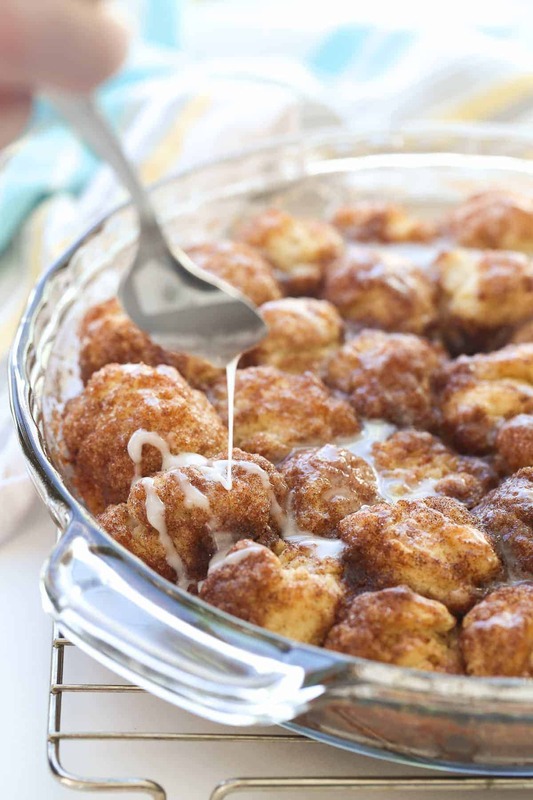 I love a good monkey bread made with yeast dough — who doesn’t? But there are days (okay, most of them) that yeast dough can take a little too much time and effort. This biscuit dough comes together in 5-10 minutes max, and you can easily make the dough ahead, wrap it in plastic wrap and refrigerate until the next morning or whenever you want to bake these bites. You can also make the dough, prepare your pan, coat your dough balls in the cinnamon sugar, place in the pan and cover with plastic wrap or tin foil and refrigerate until ready to use. Then all you have to do before baking is drizzle with the melted butter and preheat the oven. They really are so simple that you have no excuse to make them! No excuse not to have warm, sugary, buttery bites of fresh bread coming out of your oven in about 35 minutes. That sounds like a pretty good deal to me. *Freezer directions: you can roll your biscuit balls, coat in sugar and place in the pan and then cover and freeze completely. Keep frozen for up to 1 month, then let thaw on the counter at least 30 minutes-1 hour before baking as directed. You may need to increase baking time up to 5 minutes. 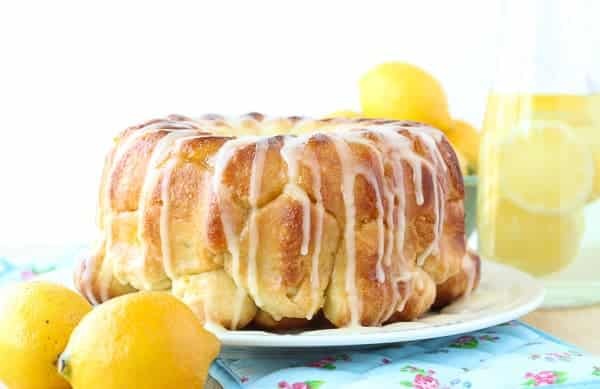 You might also like this Glazed Lemon Monkey Bread! See how easy they are to make and subscribe on YouTube! Treat yourself to these buttery, cinnamon and brown sugar coated bites right out of the oven -- they come together in no time! In a large bowl, combine flour, baking powder and salt (I mix with my pastry cutter). Cut the butter into cubes and add to the bowl. Cut in the butter with a pastry cutter or fork until butter is in pea-sized pieces. Stir in milk gradually, adding just enough so that the dough comes together. Bring together in a ball with your hands (if you accidentally add too much milk and it becomes sticky, just add a little more flour). *See post above for make ahead directions. Preheat oven to 350 degrees F. Grease the sides of a 9-10" pie plate. Place 3-4 tbsp melted butter in the bottom of the pie plate and swirl to coat the bottom. In a medium bowl, combine brown sugar, granulated sugar and cinnamon. Roll dough into 1" balls. Dip balls in remaining melted butter and then coat in cinnamon sugar mixture and place in the pie plate. Drizzle melted butter over the dough balls in the pan. Bake for 23-26 minutes until biscuits are cooked and butter/sugar mixture is bubbling in the bottom of the pan. *If you're using a pie plate smaller than 10", it's a good idea to place a piece of tin foil in the oven under the plate to catch any possible drips. I watched the video after I had already put the balls in the oven and I’m wondering about the part when you rolled them in the butter before rolling in the sugar mixture but that isn’t in the recipe. My dish turned out really bitter, do you think that could have been the problem? Thanks! The ingredients are the same and I make the recipe both ways, so that wouldn’t give them a bitter flavour. I’m sorry that happened! Hey! I just made this and the dough is like really bitter. Would it help to put sugar in the dough? Or make the balls smaller? Thanks! Hi Lindsay! That’s honestly something I’ve never heard before. The dough is regular, plain biscuit dough, so it won’t be sweet but it’s definitely not bitter. The amount of sugar the dough is coated in should definitely give you a sweet result! I also had them turn out bitter…like there was too much baking powder and salt, or baking soda. I followed your recipe exactly, but didn’t get the results I was expecting. Can you bake them a day ahead? You’re right, Ashley! Cinnamon, sugar and butter make everything perfect. We’re in rainy season now. These cinamon rolls and a cup of hot tea are perfect in a rainy day. These are perfect for a rainy day! Thanks Lucy! My mom used to make a breakfast very similar to this and it was totally my favorite!! I haven’t had it in years and I’m super excited to try this one, Ashley! Thanks Sarah! Every time I make it I can’t get enough! Oh wow does this look AMAZING! 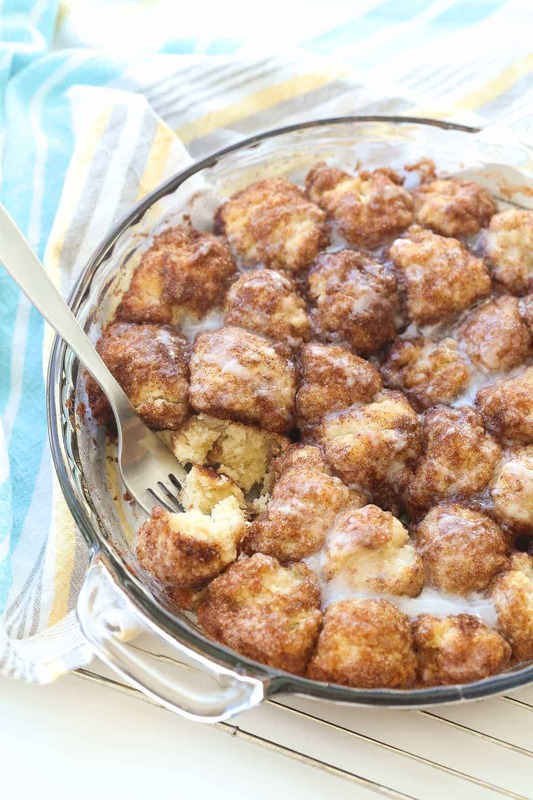 I love how this is like monkey bread, but in cinnamon roll form. And I love that it’s completely homemade, too! What a fun breakfast or dessert! Yes totally! It’d be so easy to use store bought dough but I find biscuit dough comes together so quickly, there’s no need! I didn’t show the adding of the butter in the pie plate in the video but I did do it. The video is just to be used as a guide, the recipe is always the way I make them. I hope you enjoy them! These are very easy to make but I found there is way too much butter. The bottom was literally soaked in butter. I definitely will make them again but I will use less butter. Hi Dorothy! That’s too bad! I have never found there to be any extra butter in the pan actually — they always are slightly crispy around the edges because of the sugar. Feel free to change it up as you see fit! I love this recipe! But is it possible that for the glaze, that you would be able to replace the powdered sugar with something else? Thanks! I use powder sugar and milk and just keep adding them together until it is a thin consistency and it tastes wonderful!! Hi Ashley, I wanted to stop by and let you know that I tried your recipe for cinnamon roll bites a while back and they were delicious. My daughter and I made them for breakfast and we had a great time. One question, though, can I cut down the butter to about 1/2 a cup without compromising the taste and texture? These were tasty, but 1 cup of butter for me was a bit too rich and I would love to make them again. Thanks for the great recipe. Hi Neeli! I’m glad to hear that! You would really need to substitute the butter with something. I’ve used margarine before. The butter in the biscuits would be difficult to replace, unless you found a completely different biscuit recipe that uses something other than butter (though I’m not sure what, because that’s what makes a biscuit a biscuit!). The butter that you melt to dip the balls in could likely be replaced with another oil or margarine, but you need something to get the sugar to stick and to crisp them up. I hope that helps! Thanks for responding so quickly to my question. I will make this recipe again by cutting down on the melted butter and see how that works. I don’t want to replace the butter with another fat, although I love my lard biscuits, too. Either way, this recipe is still delicious and something that I look forward to making again. I found this recipe on your site the other day and I have literally made them everyday. My children love them and eat them for breakfast as well as snack, my husband loves them with a coffee and I’ll pop one in my mouth when ever I get a chance. I have even sent them into my kids teachers as a little treat and have heard nothing but praise for how delicious they are! I did add a little sugar and about a teaspoon of cinnamon to the flour mix just to give it another little pop but these are the most delicious and easy treat ever!!! Thanks Anne! I’m so glad to hear they’re a hit! OMG! I just made these (not for the first time). I didn’t have any biscuits but I had a tube of cinnamon rolls so I used them. Wow! So good! I mixed the icing that comes with them In with what I make and it turned out so yummy! I can imagine that would be so good! 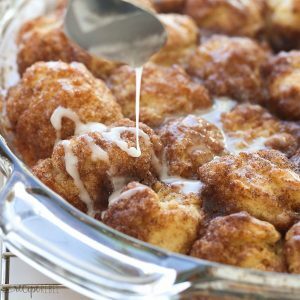 If I use canned biscuit dough, how many biscuits would I need for this recipe and how many cinnamon bites would I get out of each biscuit? Cut them in fourths? It’s hard to tell from the picture just how big each “bite” is…. I usually roll them into about 1″ balls. Probably 4-5 out of one biscuit would be good! My biscuit recipe usually makes about 10 biscuits — I’m not sure how many biscuits come out of one package? There is plenty of sugar mix though if you have extra biscuits — you could definitely do another pan! I had bout 1/2 of the sugar mixture left. Should it be sprinkled over the top before baking? Hi! So i tried this recipe out and I formed the dough into a ball but once they were baked they flattened out. Do you know where I could have gone wrong? Thanks so much!! Do you mean you formed the dough into multiple balls? I would guess that you could maybe use a smaller pan and they would bake up more instead of spreading out. I would also make sure your dough is the right consistency and not too soft. Hope that helps! A bunt pan works best for keeping their shape. I’m sure that would work! I would just add the butter just before baking. Made this with my daughter for Christmas Morning. We prepared everything on Christmas Eve and refrigerated overnight. On Christmas morning I realized that we forgot to use the brown sugar and that my husband bought baking soda instead of powdered sugar (don’t ask). I went ahead and sprinkled the brown sugar on top of the balls and popped them into the oven. Without powdered sugar, we omitted the glaze. The house smelled amazing as our girls opened their gifts. We enjoyed these very much and my girls want them again for New Years day. They were much better than I was expecting. Rather than tasting like a biscuit with cinnamon and sugar, it tasted like a really delicious coffee cake. We did not miss the glaze at all. Highly recommend! Made these for the breakfast club at school, only difference is we added raisins and the kids just love them! Huge Hit!!! Thank you for the awesome recipe. I’m so glad! Thanks Carole! I was wondering what to make for sunday brunch tomorrow and the link for these popped up on my FB feed, so cinnamon bites it is 🙂 was thinking Id really spruce it up by adding bacon – either baking it with the rolls or sprinkling on top after they have cooked. Either way I’m drooling thinking about these morsels of cinnamon luciousness! Baking would be awesome with these! I hope you like them! I was wondering if you think I could replace the butter with coconut oil? Or may half butter and half coconut oil. What do you think? Do you mean to substitute the butter in the biscuits or melted on top? Or both? To be honest, I’ve never baked with coconut oil. I’m not sure how flaky the biscuits would be if you used coconut oil in the biscuit dough, it might work! As for the top, I’m not totally sure how it would work, but I don’t think it would change things too much. Sorry I can’t help you more! Can i prepare these say friday afternoon and bake them saturday morning? That sound be fine! I’d just make sure you cover them well and leave off the melted butter til you want to bake. What milk do you recomend using foe the recipe? As a rule, I use 1% for everything. But any kind of milk would work, even non dairy milk! I love cinnamon buns too and these look so cute!!! and much easier for small snacks, or if you’re having people over.I often bake GF now so I will try this with my gluten-free flour mix. I love that these are quick and easy too! Thanks for sharing, I’m sooo looking forward to giving these a try! Thanks Dana! They went over really well here! This looks wonderful and I want to try this ~ it’s definitely something my family would like. Melanie, can you tell me what the icing sugar that the glaze calls for? Thanks! WHAT IS ICING SUGAR AND HOW DO YOU MAKE IT? Icing sugar is a powdered sugar. I’m not sure how you would make it. If it’s not something you have available you can always swap out the glaze for one you’re more familiar with. These look marvelous! Thank you for the recipe! Can you use canned biscuit dough and say pinch off and roll into small balls ? What time and temperature alterations would be needed ? Definitely could devour a massive bowlful of these cinnamon roll bites right now.. they look like the ultimate delicious sweet snack food! They are so good fresh out of the oven! Thanks Thalia! I love cinnamon rolls, and these mini ones are just too cute! Girl, you are making me hungry and I am in bed and tooooo lazy to go get food right now 🙂 These bites look decadent and amazing! These are adorable, Ashley! I am a sucker for cinnamon rolls and mini bites coated in cinnamon and brown sugar is such a fun idea! Love that they come together easily too! My goodness, restrain me before I dive into this whole dish! I’m not a huge fan of cinnamon rolls, but I love these little bites. I would probably snack on these all day! Such a good idea to use a biscuit dough! I love cinnamon rolls but they take so long to make so this is perfect. Oh yes! They look so good. Seem fairly simple too. Love cinnamon. Have a great Wednesday Ashley! Thanks so much Melanie! They are super simple — I love anything warm and cinnamony that I can make ahead and bake in the morning!